Podcast: Has anything like this ever happened to you? What’s up? Nesse episódio do podcast Inglês Online eu falo sobre algo que me aconteceu na última sexta-feira e que achei incrível. Hi, everyone. Today we have a new episode of the inglesonline podcast. Please subscribe to this podcast using the Podcasts app for iPhone and iPad, or listen to the episodes using the Inglesonline Android app. So last week I was doing one of my walks. I had just left a large avenue and turned left onto a narrower street. Now, let me paint you a picture: this is a typical residential street where you see one car driving by, like, every ten minutes. It’s a very quiet street – actually it’s almost like a boulevard. 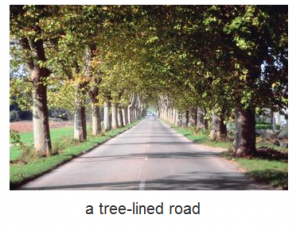 One of the dictionary definitions of boulevard is “a wide, tree-lined road in a city, often used as a promenade”. I guess the street I was in qualifies as a boulevard… Let’s see: wide, check. Tree-lined road, check. In a city, check. Often used as a promenade… hmm, I don’t know about that. Usually there’s no car traffic at all on promenades, which isn’t the case here. Other than that, though, the road I’m talking about looks like a boulevard. Like I said, it’s a quiet road, tree-lined, you rarely see a car driving by, not many pedrestrians… Anyway, it was really hot – it was around four in the afternoon and if you were in São Paulo last week, more especifically last Friday, you know the kind of ‘hot’ I’m talking about. So that’s why I wanted to walk along this boulevard – so that the trees would shelter me a little bit from the sun. So there I was, happily walking and listening to some podcast on my mp3 player, when… it happened. Somehow I tripped and fell, and twisted my ankle in the process. Yep, I fell and landed on the sidewalk, and there I stayed for at least two minutes ’cause my right foot and ankle were hurting really bad. So after about two minutes I managed to get up and then I tried to take a few steps. No go. So I just hopped across the sidewalk on my good foot and sat by a tree. There was no one in sight and it was really hot, so I just thought it would be a good idea to sit down, rather than keep standing on one leg. And that’s when I realized that I would probably have to wait a while until the pain subsided a little, so that I ‘d be able to walk to the nearest avenue… which, by the way, was a good three blocks away. I didn’t have my cell phone on me, so getting to the avenue was my only hope of finding a cab. Are you guys with me, so far? So, as I’m having those thoughts sitting against a tree I hear the sound of a car engine. You know, the sound you hear when a car’s pulling up to the curb. And my thought was “Wow, that’s unexpected but it must be one of the residents arriving”. The engine was still running. I turned my head and saw the front of the car. Well… It was a white car. Anyone who’s familiar with the city of São Paulo will know that pretty much every white car you see is… a taxi cab. I couldn’t believe a white car had just pulled up to the curb… right behind the tree I’d been sitting at. I stretched my neck a little and spotted the TAXI sign on top of the vehicle. Yep, it was a taxi cab. My next thought was “This cab must be dropping someone off – I need to run and and talk to the driver before he leaves!” So I got up as quickly as I could and hopped around the tree till the driver saw me. And here’s the thing, there was no one being dropped off. No passengers, just the driver. The guy rolled down the window on the passenger’s side and I asked him if he was free for the next passenger. He said yes, and then I asked “Why did you pull up…?” And he said “Oh, I was just gonna grab a bottle of water I left in the trunk”. So that’s the true story of how I twisted my ankle while walking in a really quiet road, and out of nowhere a cab driver showed up right behind me because he was thirsty. Has anything like that ever happened to you? ‘Til next time! Hi, everyone!! Thanks for stopping by. I starded listenig your podcast this week…. I am very impressed with the podcast qualities ….so good… this never hapened with me…but i belive is God take care of you all the time!!!! It’s is called : God is always taking care os us, if you believe or not. Thanks for the lessons and good week. I think you are good luck kind guy. Kisses!! Something like that already happened to me once. Also I hurt my ankle so I was going home and twisted my ankle. I tried keep walking but I couldn’t, in this moment my friend was driving on street and he gave me ride to home. I thanked him very much, because I don’t know what would I do in that moment. I left my cell phone in my house. Thank you for share your story with us. It is a kind of sad story with happy end, good for you and good for us, your listeners. And no, – as far as I can remember – nothing like that has ever happened to me so far. I’m glad everything turned out alright for you. Good things always happen to those who do good things, simple like that. Thanks, Chris. Yep, I had to interrupt my daily walks for a while but it’s all good now.